The Fourth Amendment of the U.S. Constitution protects citizens from unreasonable searches, seizure of property, and from unwarranted arrest. In order for a lawful arrest to take place, arresting officers must have probable cause or an arrest warrant issued by a court with the jurisdiction to do so. Officers have a great deal of discretion when determining probable cause, but they must show that there was a reasonable degree of suspicion in order to make an arrest. Officers can use hearsay and circumstantial evidence in order to make an arrest, but this evidence must be such that any prudent person, having the same evidence, would conclude that a crime was about to be committed, had been committed, or was in progress. Any police officer who fails to establish that probable cause existed before the arrest was made is guilty of false accusation and is in violation of the protections afforded by the Fourth Amendment and state law. If you’ve been subject to false incarceration in New York, you need a false arrest lawyer on your side to protect your constitutional rights and your reputation. False arrest is often accompanied by trauma and other harmful unintended consequences. Individuals who have been falsely arrested may face sanction from their places of employment or their jobs. Officers who commit false arrests may use excessive force, humiliation, or other tactics in conjunction with the arrest. Fortunately, the law affords important civil protections to victims of false arrest. Goldberg & Allen, LLP are false arrest attorneys in New York City who understand the violations and damage that false arrest can cause, and we fight diligently to protect the civil rights of our clients. For eyewitnesses of police activity, the law is crystal clear. As long as you’re not interfering with police activities, you are legally allowed to film police on duty. The key word here is “interfering.” What exactly does that mean; what constitutes “interfering?” The answer to that isn’t entirely clear. One of the main points of contention here is how far away eyewitnesses should be standing with their cell phone cameras so as not to get in the way or obstruct the officers. If, for example, an eyewitness is standing so close that it distracts the police from their activity, or the police officer can’t tell if the person is holding a camera or a weapon, this could cross the line into what could be deemed interference. In cases, however, the eyewitness has not actually interfered in any way with police activity, and the police had no right to make a conviction. When individuals have been falsely imprisoned or arrested, they have the right to seek damages from the city and the officers who were responsible for the unlawful arrest. In some cases, victims of police brutality have been entitled to receive tens of thousands of dollars, or more, in compensation for the trauma and harm caused by the arrest. Victims of false arrest not only face social sanctions from their communities due to their interactions with the police, but they may also have to miss time at work due to the arrest. Seeking damages from the offending officers holds the police accountable for their actions and ensures that individuals will continue to be able to legally record police activity in the future. If you’ve suffered a false arrest in New York, you need an experienced civil rights and lawyer licensed in New York on your side. Taking photographs and/or recording video of anything plainly visible from public space is your constitutional right. Federal buildings, transportation facilities, and active duty police officers or public officials all fall under this law. Unfortunately, it’s not uncommon for police officers to order civilians to stop taking photographs or recording video in public spaces. In some cases the offending officers will harass, detain, or even arrest people for using their recording devices to record police activity. If you’re the victim of a false accusation, please contact Goldberg & Allen, LLP immediately. We are false arrest lawyers in New York who work with clients in Manhattan and all of New York City to protect their civil rights. 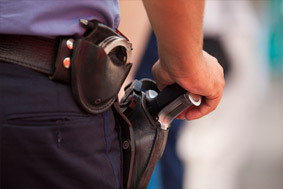 Officers are required to establish probable cause before making a bust. Sadly, in many cases, what officers call “probable cause” is actually the result of racial bias. New York’s police force has come under fire for unfairly targeting black and Latino youth, subjecting them to unreasonable searches, frisks, and convictions. These encounters with the police often put people in a situation where they are affected for the rest of their lives. Having a police record can affect employability, ability to apply for Federal financial aid, and can result in denial of other rights. Even as the police commissioner has asked law enforcement to stop arresting individuals for possessing small amounts of marijuana, Latino and black youth continue to remain targets of unreasonable searches and arrests. 85% of individuals arrested for marijuana possession are black or Latino. If you were arrested due to racial bias, you have the right to seek compensation and justice in court. Goldberg & Allen, LLP are false arrest attorneys in New York who understand the law and can offer you an honest assessment of your case. False arrests often violate both state law and Federal civil rights law. While the definition of false arrest under state and Federal law may be similar, the legal processes that must be followed to file a lawsuit at the Federal and state level vary significantly. Procedures must be followed precisely or a plaintiff’s case may be dismissed. While probable cause is an adequate defense for the arrest of an innocent person, individuals have the right to defend themselves if they believe they were falsely arrested. If a person can prove in court that the officer acted maliciously, lied, or that the officer misapplied the law, then a lawsuit for a false arrest can proceed. If your civil rights have been violated, you have a limited time to file a suit. Under Federal procedure, a suit for false arrest is subject to a three year statute of limitations. This means that as soon as you have been released from jail you have a three-year ticking clock in order to file your suit. Under New York State law, citizens who wish to sue the government must first file a notice of claim, usually within 90 days of incarceration. Under New York State law, the statute of limitations is 1 year and 90 days. Filing a lawsuit for false arrest in New York can be a complex process. You need a false arrest lawyer in New York working on your side to ensure that all procedures are followed. Goldberg & Allen, LLP fight diligently to protect the civil rights of citizens who have been falsely arrested in New York. Because we specialize in civil rights violations cases and have decades of experience in criminal law, we know the limits of the law and can reasonably and honestly assess whether you have a valid case. We understand that often racial and cultural biases are at play when officers make false arrests. If you’ve suffered a false arrest, you need Goldberg & Allen, LLP—skilled attorneys in New York.